April coal exports continue to be the lone bright star for domestic coal producers as domestic coal demand fails to rebound from already dire 2017 levels. Strong world coal markets, with CIF ARA thermal coal and Australian low-vol HCC metallurgical coal continuing to trade at high levels, enabled U.S. coal exporters to record the highest volume in over five years, dating back all the way to March 2013. According to U.S. Census data for April 2018, the U.S. exported 11.55 million tons of coal, an increase of 17 percent over last month. The total of 40.6 million tons for the first four months of 2018 is more than 30 percent above 2017, on pace for 120 million tons by year’s end. 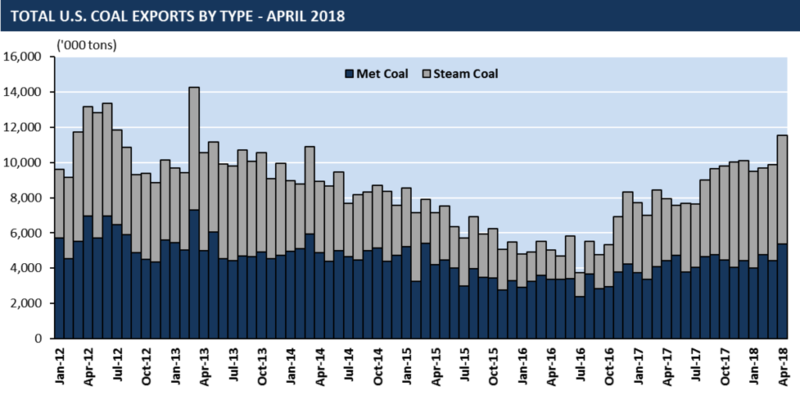 U.S. met coal exporters added almost 1 million tons to last month’s total, exporting more than 5.3 million tons in April 2018. 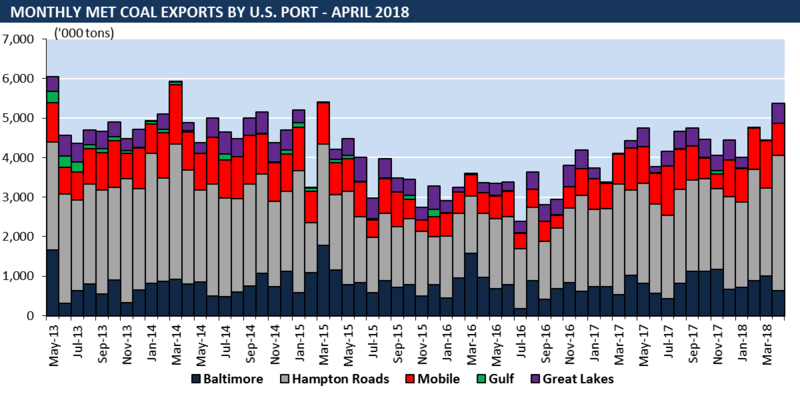 Met coal exports through Hampton Roads increased 54 percent over last month as Norfolk Southern prioritizes met coal exports over thermal coal at its Lambert’s Point terminal due to higher profit margins. This increase more than offset the decline in exports through Baltimore and Mobile. 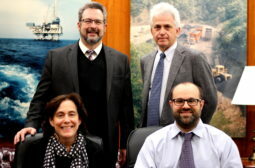 “We see April’s met export numbers as likely the current ceiling for U.S. met coal exports since traders fail to find additional export capacity as NS continues to operate only half of its 38 million tpy Lambert’s Point coal terminal.”, said Phillip Graeter, Manager at Energy Ventures Analysis. As CIF ARA prices continue to trade well above $90 per metric ton and domestic demand fails to rebound from dismal 2017 levels as customers draw down existing stockpiles, U.S. coal producers remained focused on the export market. This month’s almost 6.2 million tons of U.S. thermal coal exports mark the highest level since March 2013. As Germany’s last two hard-coal coal mines closed, European demand for thermal coal rebounded, adding almost 800k tons over last month. “NOLA appears to be the main beneficiary of the met-over-steam prioritization at Hampton Roads,” said Graeter. 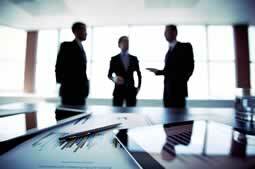 Exports increased 34 percent MoM, with Europe as the main destination. 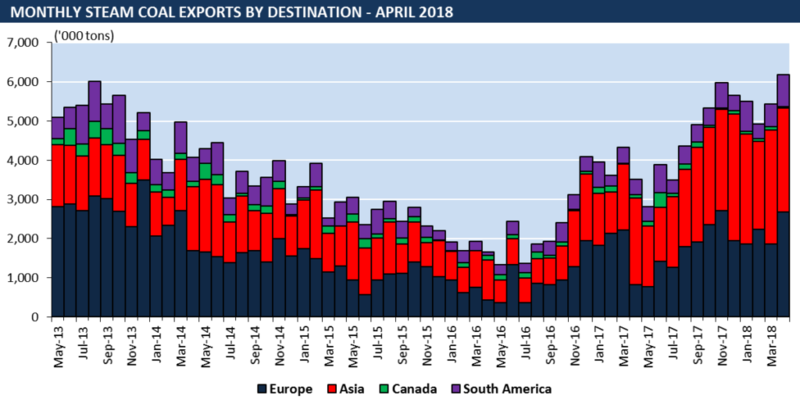 For more information on the April coal exports with port-by-port and basin-by-basin export data, please subscribe to EVA’s Monthly Coal Trade Report. Energy Ventures Analysis offers in-depth knowledge and expert energy consulting services to clients in the electric power, natural gas and oil, coal, environmental and renewable energy industries. EVA offers cutting-edge energy consulting services, including energy market fundamentals, economic analysis, and operational management that has led the firm to international recognition. EVA recently has been recognized by Forbes magazine as a top energy consulting firm with outstanding energy consulting services and customer satisfaction.